If you’ve decided you want to work in magazines devoted to music, fashion, travel music or any other specialist area, the course at Up To Speed can help you. 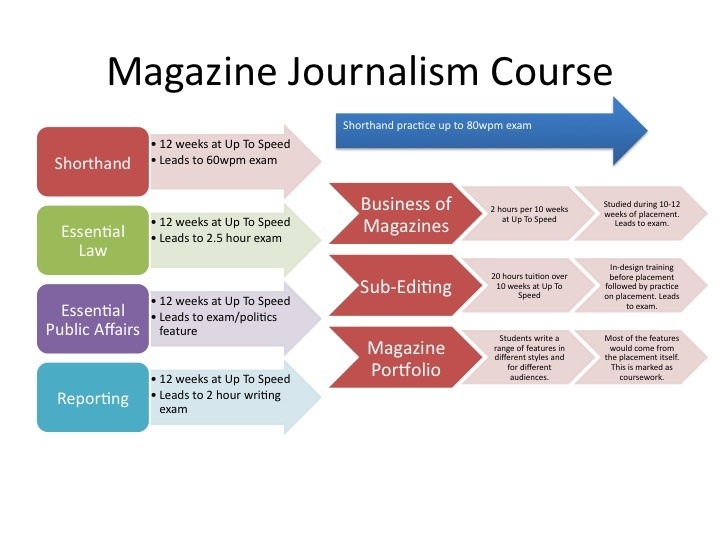 The magazine journalism course at Up To Speed is divided into two terms: a classroom-based first term covering core subjects and then a practical second term with journalism work placements and specialist options allowing you to opt for courses that will help you make it in the world of magazines. An intensive 12-week term at our training centre in the Daily Echo, Bournemouth. You will learn how to write news, how to take notes in shorthand and study the Media Law and Politics you need to be an all-round journalist. During the term you will also take classes in magazine journalism to prepare you for the exams and placements in the second term. In the second term you put the lessons you have learned into practice while devoting more time to your passion for magazines. During this term you will continue your classes in Magazine Journalism and build on your shorthand speed. Shorthand exams usually take place on Thursdays and Fridays. You will take your final exams in Production Journalism(Magazine Sub-editing) and Business of Magazines in January. The course calendar suggests weeks during this term when you can aim to complete work placements at magazines. These will be arranged by you with help and guidance from Up To Speed’s tutors. We will start helping you to secure a placement as soon as you have accepted an offer and paid your deposit. NB You need to plan several months ahead for magazine work placements as competition for them is intense. Stories published on placement will go into your Multi-Media Portfolio. Multi-media Portfolio consisting of features and articles produced during your placement and on your time on the course. Further Shorthand exams up to 100 wpm.